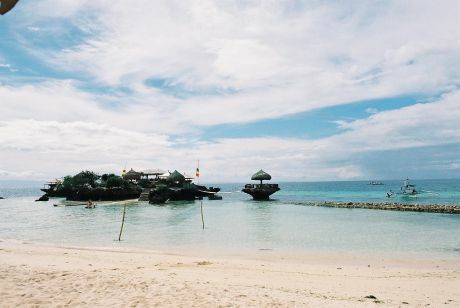 Camotes, a group of islands in central Philippines is located 36 nautical miles off mainland Cebu comprising three main islands of Pacijan, Poro and Ponson. Though these islands are bounded by geographical proximity, each has a distinct history and character of its own. These islands were first mentioned by Pigafetta, in his chronicle of Magellan's voyage when their fleet anchored near these islands from Mazaua before proceeding to discover Cebu . Camotes has a population of 76,707 scattered in its four municipalities of San Francisco , Poro, Tudela and Pilar. Most of the local folks are farmers and fishermen. Camotes can be reached by sea. There are regular daily trips from Danao City and Cebu City . The pump boats in Danao leave for San Francisco , Poro and Tudela at 7:00 in the morning. A 1.00 pm afternoon trip is scheduled for Pilar. There is a fast craft that leaves for Poro at 6 in the morning and 6 in the afternoon from Pier I. Travel time is approximately an hour and 15 minutes. There is one airstrip in the island of Pacijan , in San Francisco . Flights can be chartered through private plane companies based in the Cebu City . Poro High cliffs and a rich history characterize this gateway town to Camotes. Buho, a beach destination nestled amidst a rock resembling a ship is a good place to watch the island sunset. There is a waterfall in Barangay Libertad named after Panganuron, a legendary figure in Camotes history. Mount Three Peaks , the highest point in Camotes offers a vantage point where one can see the whole Camotes Islands . It can be reached by hiking. Artifacts unearthed in various sites and in Sitio Maktang, the oldest settlement in Camotes, are temporarily housed in the municipal hall. San Francisco This town is located in Pacijan Island and is fringed with numerous kilometer stretches of white sand beaches. These are ideal for nature trekkers and backpackers. Tulang islet with its lighthouse and fishing boats offers magnificent seascape vistas. Lake Danao is ideal for bird watching, camping and canoeing. It has an islet located in the middle. Tudela Caves abound in the area. 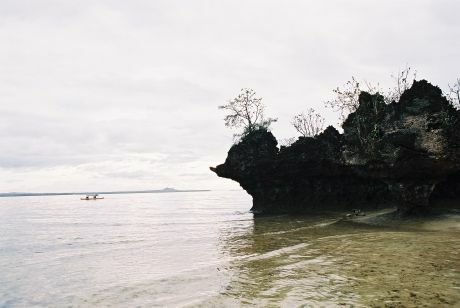 The most famous of all is Bukilat Cave in Barangay McArthur which features interesting formations and natural skylights. A pool of fresh water provides a refreshing dip for spelunkers and tourists alike. There are other countless unexplored caves waiting to be discovered. Mag-agay-ay has a very interesting shoreline with stunning rock formations. Pilar Serenity and nostalgia best describe this town. Isolated beaches and old houses set the mood for a perfect lazy day. Must sees are Cawit, a beach ideal for overnight camping and enchanting blue lagoon of Naukban in San Isidro , a symbol of love fulfilled between two enkantos (spirits). The Municipality of Poro was founded on December 15, 1701 but was given recognition by the Spanish Colonial government only on January 16, 1780 through the efforts of Pedro Estrera who was named the first Capitan of Poro as recognition of his leadership. The name Poro came from the Waray word puro, meaning island. The early settlers of Poro came from Samar, and later, they were joined by others from Cebu, Bohol and Panay . During the Spanish period, Poro was already a thriving community overseen by Jesuit Mission posts in Palompon, Leyte . A survey made by the Spanish authorities under Capitan General Gomez Perez Dasmariñas in Manila on May 31, 1591 revealed that the whole of Camote ( Camotes Island ) and Mactan (Mactan) had 287 tributes with a population of 1,148 inhabitants. By this time, periodic raids from marauding slave traders had become the constant threat to the growing populace. The Alcalde mayor of Cebu thought that it was better for the natives to unify and defend themselves from the attacks. 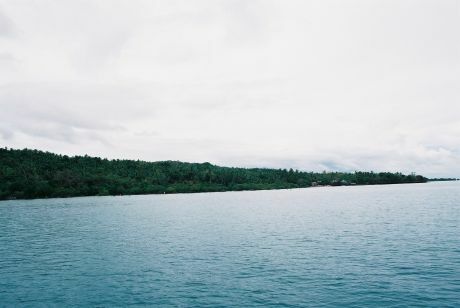 Poro at that time had two settlements: Maktang (now a sitio of Barangay Esperanza of Poro) and Tag-Anito (now the municipality of Tudela ). A conflict arose as to which settlement should become the seat of government. On the advise of Panganuron, an elder who lived on the banks of a river (now Barangay Libertad), the two settlements journeyed on foot towards each other at the break of day. They met on the site of what is now Poblacion, Poro, approximately eight kilometers from both settlements. On that day, inhabitants of the two settlements came to live together for the first time. They built a chapel on this site which later on was improved and became the parish church. The establishment of Poro brought about the creation of three more parishes in the Camotes Islands : Pilar (1859), San Francisco (1863) and Tudela (1898). The Philippine Commission Act 952 was enacted on October 22, 1902 reverting back Camotes Islands of Cebu Province . Earlier the Spanish government has annexed Poro and the rest of Camotes Islands to Leyte because of geographical proximity. Perhaps Camotes was seen as nearer Cebu City , the seat of the Cebu Government, than Leyte's set of government which is Tacloban City . Other events followed: five days after Camotes joined Cebu , Poro was annexed to Tudela, a former settlement of Poro. In 1909, it was re-established again as a municipality although the seat remained in Tudela until 1914 when the seat was transferred to Poro. Porohanons are descended from generations of seafarers who came and tamed the restless sea the sea that in turn defined and shaped their lives. In the early days when the dry Habagat wind battered its shores and when the nippy air of the Amihan turned up, the island isolated itself from its neighbors. All activity is suspended; trade from other ports and news from the mainland temporarily came to a stop. Thus, once in a while, they lived a life of seclusion, waiting for the unkind weather to recede. Life then meant a cycle of frequent squalls and tranquil intervals. A distinction that separates Porohanons from the rest of Camotes Islands is their sub dialect which is a combination of Cebuano, Waray, Boholano and Ilonggo. The patois is profusely spattered with the letter z and spoken with a thick accent. Dr. Resil Mojares, a Cebuano historian, said in an article that at one point in time, the Camotes dialect was distinct from either Waray or Cebuano until it evolved into a totally different sub dialect retaining older features which the Cebuano language has lost. Spoken alongside other dialects (like Cebuano, spoken by the other Camotes towns), and Tagalog (courtesy of television seta and tabloids), the Porohanon tongue is totally distinct and has survived through the years without any dilution at all. Poro is a fifth class municipality situated in Poro Island , one of the three islands comprising the Camotes Islands in Cebu Province . The municipality of Poro sprawls between 10 degrees 37' 30 to 10 degrees 43' 10 latitude and 124 degrees 23' 00 to 124 degrees 28' 50 longitude. It is bounded on the north by the strait of Kawit ; on the east by the municipality of Tudela ; on the south by the shark-infested Camotes Sea ; and on the west by the municipality of San Francisco . Travel time by fast craft from Cebu City is one (1) hour with two trips daily, 4 hours by a passenger-cargo vessel from Cebu City with one trip daily and two hours from Danao City by pumpboat with two trips per day. It is approximately 565 kilometers southeast of Manila , 62 kilometers northeast of Cebu City and 54 kilometers west of Leyte . The municipality of Poro has a total land area of 6,388.7 hectares or 63.887 square kilometers. The timberland area is 736 hectares while 5650.7 hectares are classified as alienable and disposable land. The municipality has mixed topographical reliefs. Areas around Barangay Mabini, Poblacion, Altavista and Libertad which cover a total land area of 2658.8 hectares or 38.82 percent of the total land area, have very steeply sloping lands in many directions to very mountainous to hilly areas. On the other hand, areas along the northern portion of the municipality, particularly Barangay Esperanza, have broad areas or nearly level lands and gently sloping areas with land sloping in one general direction. This slope category occupies an estimated land area of 3729.9 hectares or 54.46 percent of the total land area. The National Statistics office in its September 1995 Census on Population and Housing, revealed that the municipality of Poro has a total population of 21,517. This gives an increase of 2,371 or 12.38% over the 1990 census which was 19,146. The estimated rate of increase is placed at 2.33% per annum. By 2008, the population is expected to reach 29,131. The high rate of increase which is almost equal to the national rate of 2.36% can be traced to the increasing economic activity in the municipality which has prevented those wishing to migrate to other places and those who came back from the other places and engage in business or other means of livelihood in the municipality. The municipality of Poro is basically an agricultural economy. A total of 4,127 hectares or 60.26 percent of the total land area is devoted to agriculture. There are four major crops in the area, namely: rice, corn, coconut and fruits. Even the DENR declared timberland is planted to crops. Livestock-and poultry-raising is carried out mainly as a secondary livelihood of the people. Total backyard poultry production for 1996 was valued at P 1,190,700. Livestock (swine cattle, goat and carabao) production for the same year was P 46,802,000. 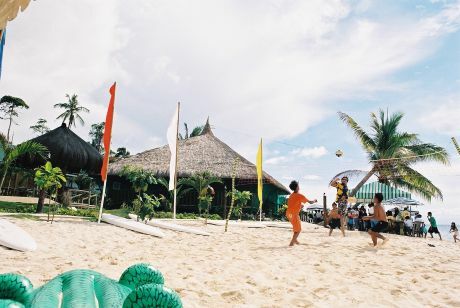 Camotes Sea provides a good fishing ground for the residents of Poro. Improved fishing methods and mechanization have greatly increased the annual fish production of the marginal fishermen with the 1996 fish catch valued at 42,5M. The DENR has classified a total of 738 hectares as timberland. However, this area is presently under cultivation and planted with coconut and root crops. A total of 722 hectares of the timberland area are considered as upland timberland and 16 hectares as lowland timberland. However, there are approximately 460 hectares of mangroves which is also declared as protected area. This area is located between Poro and San Francisco . If this area is added to the timberland area, the total would become 1,190 hectares. As of January 1997, the municipality has a total number of 500 sari-sari sores, 5 hardware, 1 gasoline station, 5 warehouses, 3 wholesalers, 30 carenderias, which are evenly distributed throughout the municipality. There is a fish market and a small public in the Poblacion, but no market day as is usually the practice in the rural areas. There is also a public market in Adela. Light industrial establishments such as small scale ironworks, furniture making, concrete blocks making are operating in the area. Presently, there are 50 employees in the ironworks industry, 25 in furniture making and 58 in concrete block making. Likewise, there are 5 commercial corn miller located in Barangay Teguis, Cagcagan, Adela, San Jose and Daan Paz employing 25 people. A group of women organized themselves and is now producing bags made from romblon and selling them to selected shops on Cebu City . There is also and egg producing association organized by a US Peace Corps Volunteer which supplies eggs to consumers in the town and in neighboring towns. A pearl culture company is also operating in the area with two pearl farms in Barangay Mercedes and Paz. As of June 1997, the municipality of Poro has a total of 6 primary schools, eleven elementary schools, four secondary schools and one college. In the primary level, Mactang has the highest enrollment with a total of 101 pupils, while Cansabusab has the least enrollment with a total of 30 pupils. The municipality has no hospital but there is an emergency clinic where emergency operations are conducted especially for those who cannot afford the high cost in hospitals. The municipality is currently served by one Rural Health Doctor, one nurse, one Sanitary Inspector and eight midwives. Barangays Libertad, Esperanza, Mercedes, Carcagan, Paz, Adela, San Jose and Daan Paz have health stations and one rural health center in the Poblacion where the Municipal Health Officer is holding office. 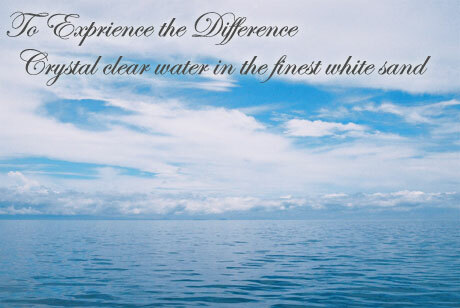 There is no regular dentist to serve the dental needs of the residents. Transportation facilities in the municipality are inadequate and inconvenient to commuters. Although there are already a number of jeepneys and other means of mass transport, there are no regular routes and trips to and from the Poblacion. The most common mode of transportation is by motorcycle. Transportation to Cebu City is regular and very comfortable. A fast craft plies the Cebu City to Poro route twice a day, one in the morning and another in the afternoon. Cargo-passenger vessels also ply this route everyday with RORO vessel scheduled every Monday. There also three trips per day to Danao City by pump boats. Ormoc City is also accessed by two pump boats daily. The municipality's road network consist of the provincial road, municipal road and barangay road with a total length of 105.5 kms. Road width averages 6 meters wide which consequently does not meet the standard. Water resource in the municipality is mainly derived from the municipal water system. The barangays served by this system are Mabini, Eastern and Western Poblacion, Teguis, Pagsa, Mercedes, Esperanza, Carcagan, Adela, Paz, San Jose , Daan Paz and Rizal. A water cooperative serves the water needs of Libertad. Others a served by deepwells and springs. The Camotes electric Cooperative (CELCO) provides power services to the municipality. As of January 1998, 16 barangay are already energized out of a total of 17.